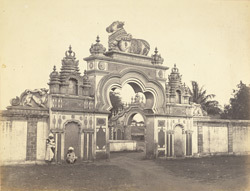 Photograph from the album of Major General Jackson Muspratt-Williams, of the entrance gate to the Summer Palace of the Maharaja of Mysore, at Mysore in Karnataka, India, taken by an unknown photographer some time in the 1860s. Mysore was ruled by the Hindu Wodeyar Maharajas from c.1400 until the 20th century, save for the period from 1761 until 1799 when the Muslim Haider Ali and his son Tipu Sultan seized power. There are a number of palaces in the environs of the city built by the Maharajas which date from the 19th and 20th centuries, after the labyrinthine old city was demolished and rebuilt by its Muslim conquerors; the most famous is the main palace in the centre of Mysore, the Amba Vilas, a spectacular building designed in the orientalist “Indo-Saracenic” style by the British architect Henry Irwin. There were two summer palaces in Mysore, the Lokaranjan Mahal, situated in south-east Mysore, and the Rajendra Vilas Palace, situated on the summit of Chamundi Hill to the south-east of the city. This view shows a gateway to the palace built in a Hindu architectural style.